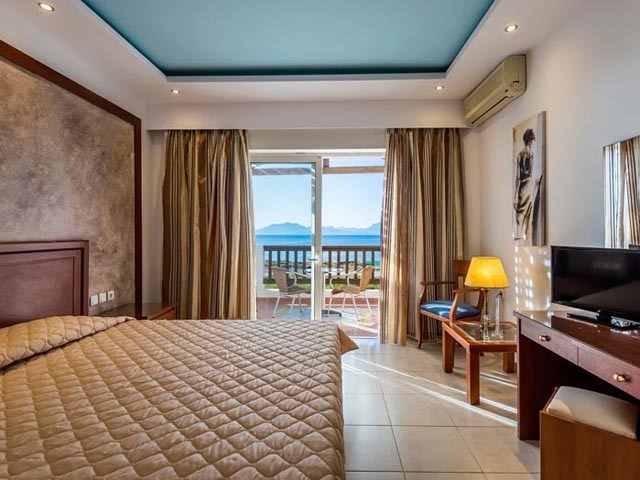 Spread out on an impressive property that borders on the sparkling, turquoise blue waters of the Aegean Sea, the Gaia Royal offers accommodation, gastronomy and entertainment choices aplenty. 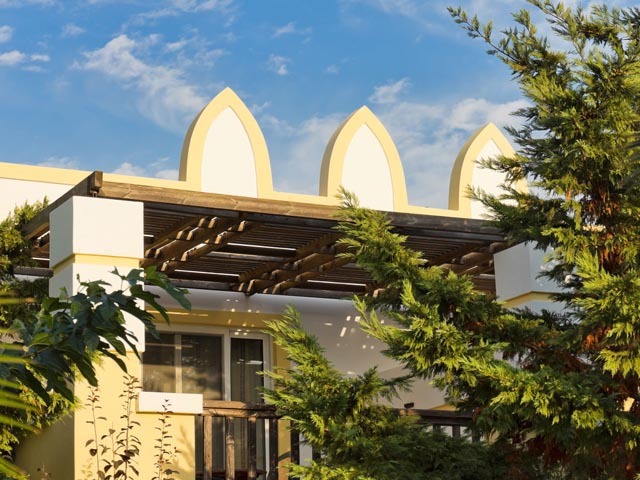 Sunny, comfortable and functional, the hotel consists of a central building that includes the reception area, lounge, restaurant and main bar, as well as a series of other two story structures that serve as guest accommodations and that radiate around this main building. 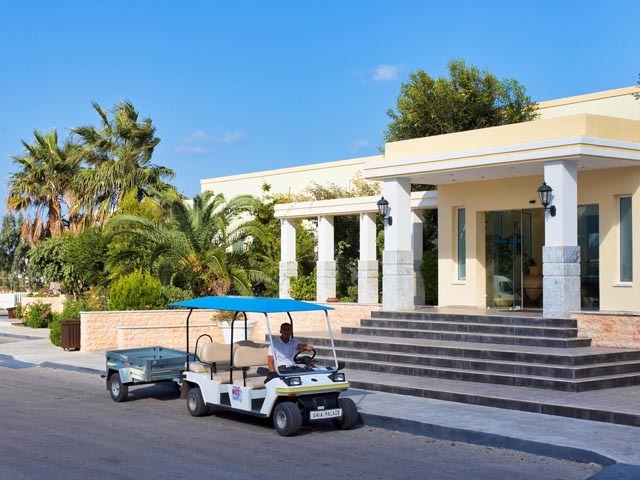 In addition to expediting check in and check out services, the reception area is where guests can obtain information not only about the hotel complex but also about the island of Kos in general. 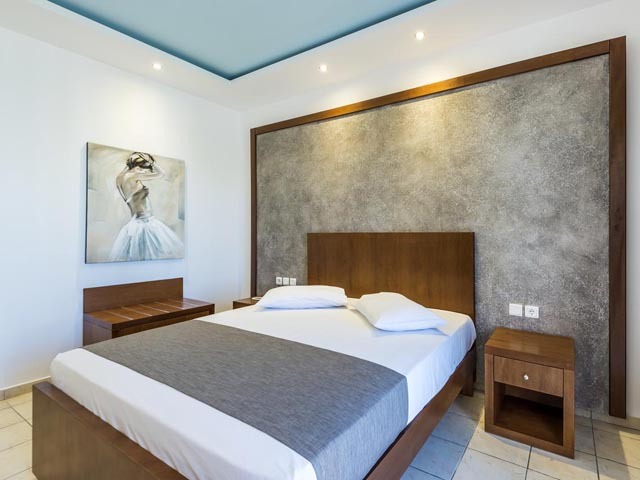 The hotel staff will provide you with everything you need regarding historical sights, natural parks and monuments, beaches, island transportation and shopping, among others. 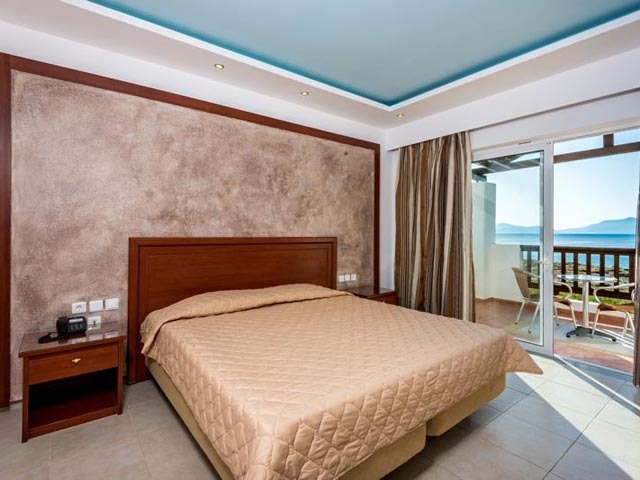 The Gaia Royal is the perfect place for fun and games as well, and offers a variety of athletic facilities including team sport and tennis courts as well as fitness programs, sporting competitions and a Kids Club for its young guests. Continuous activity that all guests can join in on and put a little action in their holidays. 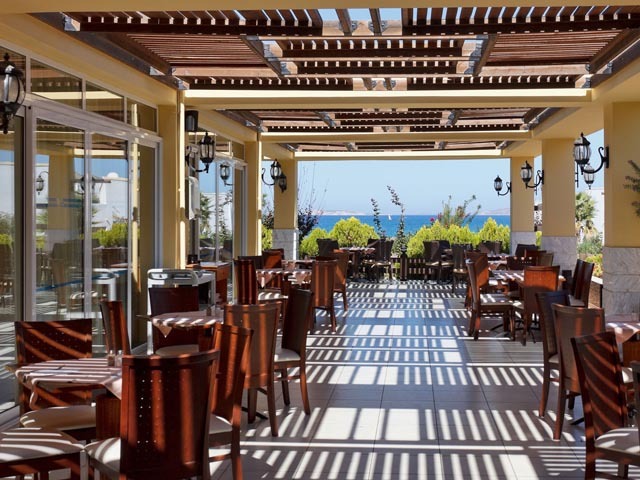 Looking out on to the Aegean blue, the Gaia Royal Hotel restaurant offers all main meals throughout the day, from early morning till late at night, with the option of both indoor or outdoor seating. A delicious American-style breakfast buffet is created daily from select, fresh local products. Aromatic and rich in variety, it offers a wide range of taste choices to start your day right. At lunchtime, hot and cold dishes, appetizers and salads, cheeses, fruits and desserts make for delicious choices in a colorful, aromatic, gastronomical symphony for all guests. Dinner at the Gaia Royal, on the veranda or inside the restaurant, offers masterfully cooked meals inspired by both the local and international cuisines. Culinary theme nights are hosted twice a week, with delicious dishes from two of perhaps the world’s most appealing cuisines, Greek and Italian. 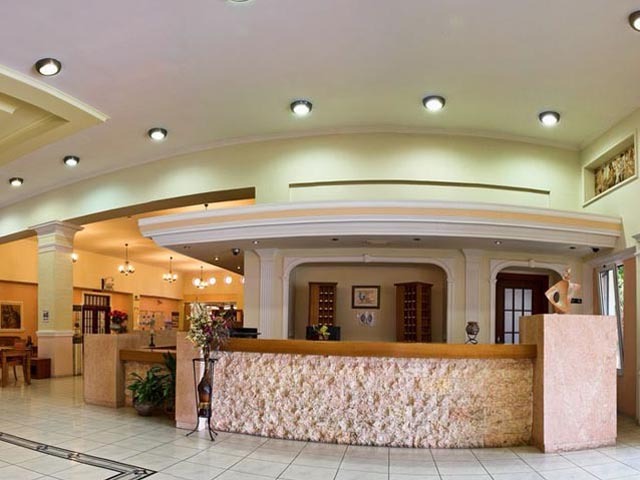 The hotel bar is located in the main lounge for relaxing while taking in a bit of television or taking advantage of the Internet. 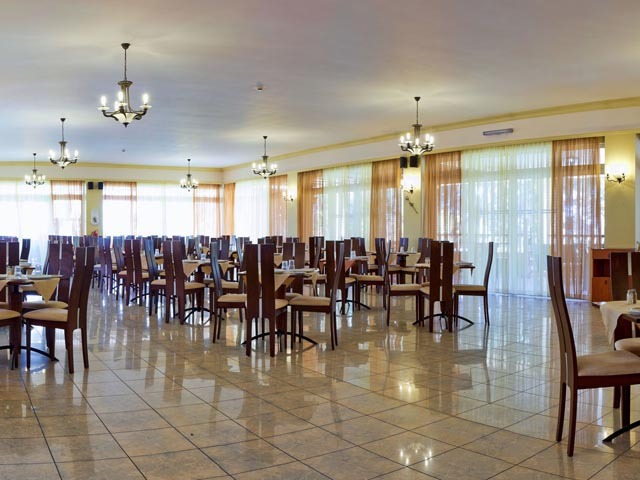 Here you will find aperitifs and other alcoholic beverages, juices, coffees and soft drinks. A relaxing and refreshing spot for any hour of the day or night. 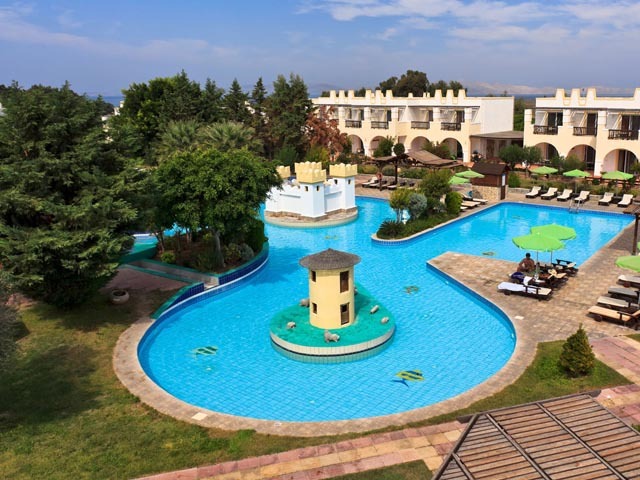 Vibrant and constantly brimming with activity, the hotel’s two pool bars are adjacent to the pools and offer guests a wide range of alcoholic and soft drink options in addition to snacks from the morning till the evening. Comfort and refinement in 25 m². 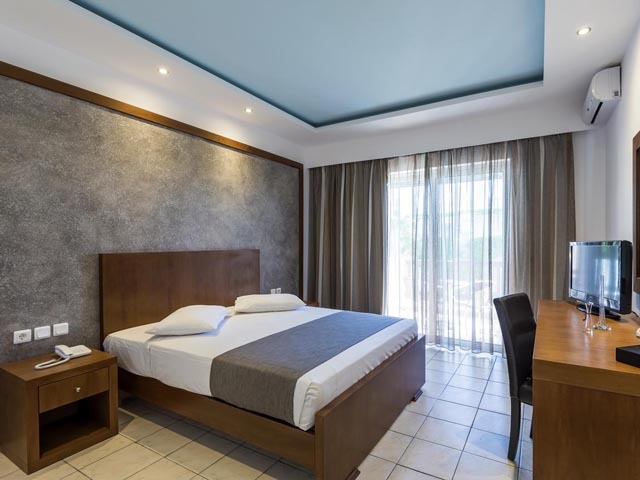 The Gaia Royal’s double rooms, with their bright color scheme and cheerful decor, can accommodate a couple with a child of up to 12 years old. 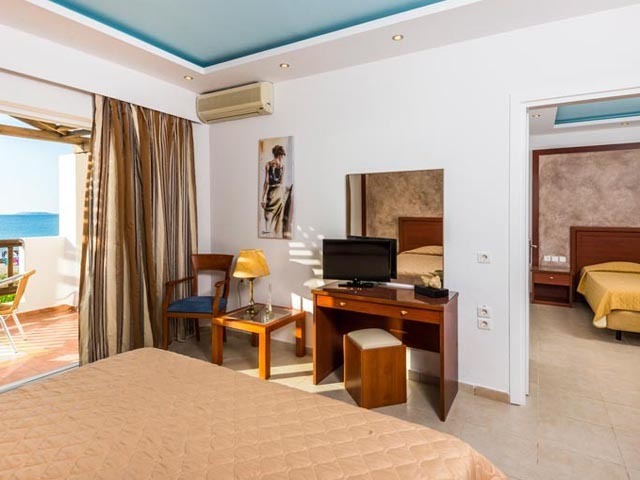 Room facilities: Satellite television, refrigerator, radio, insect screens, telephone, air conditioning and heating unit, fully-equipped bathroom with a hairdryer as well as a balcony or veranda (ground floor rooms) with garden or pool view create the perfect environment for a relaxing holiday. A compact 35 m² apartment, a spacious room. These comfortable spaces are ideal and roomy enough for families of up to five members to enjoy a relaxing vacation together. 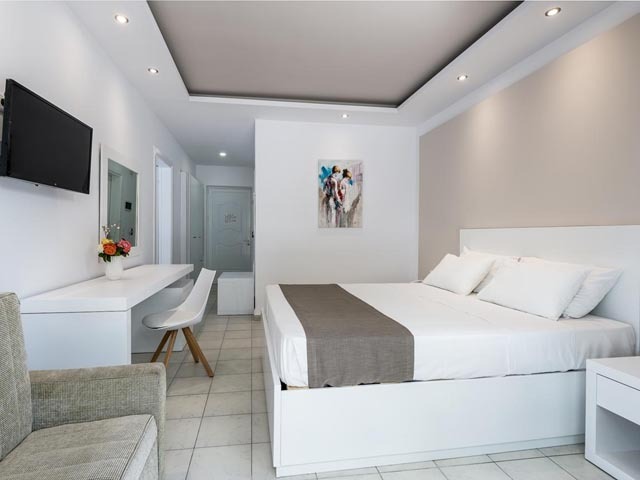 Individual bathrooms with a hair dryer, a refrigerator, air conditioning and heating unit, insect screens, satellite television, radio and telephone in all rooms offer all necessary amenities. The kos island’s second largest harbor, the quaint fishing village of Mastichari, with its fresh fish and laid back pace, is just 6 kilometers from the hotel and is the perfect destination for unwinding and getting in the island mood: mouthwatering meals at the many fish taverns lining the harbor, relaxing late afternoon coffees next to the gently lapping waves, shopping or browsing in the gift shops with their multitude of tempting merchandise. An idyllic holiday in a picturesque spot that proudly maintains the languid pace of a village of a bygone era. And for an unforgettable day trip, from Mastichari visitors can catch the daily boat taking them across the bay to Kalymnos, the island of the sponge divers. 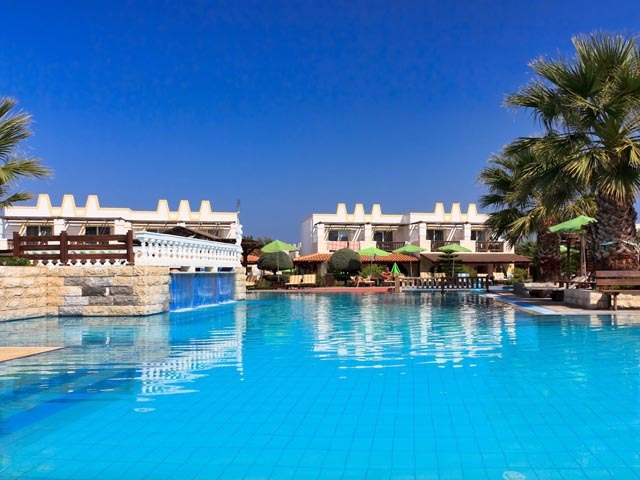 Book early and save up to 30% !!! 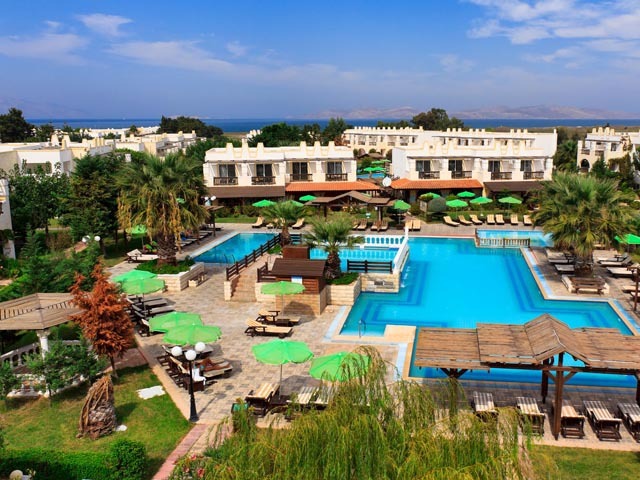 The offer is valid for a LIMITED NUMBER OF ROOMS !!! 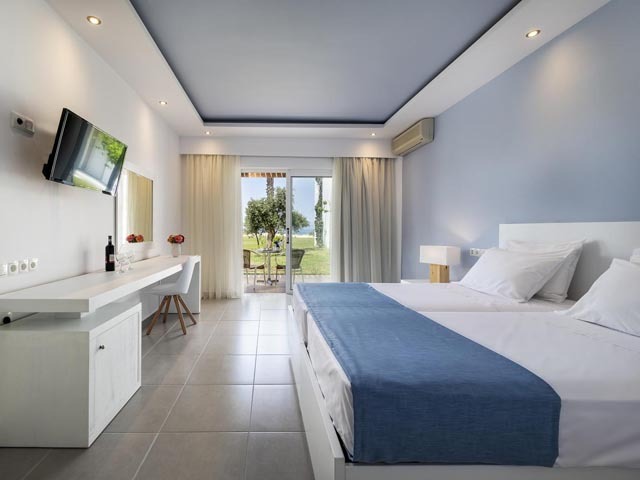 Open:April to October...Spread out on an impressive property that borders on the sparkling, turquoise blue waters of the Aegean Sea, the Gaia Royal offers accommodation, gastronomy and entertainment choices aplenty. 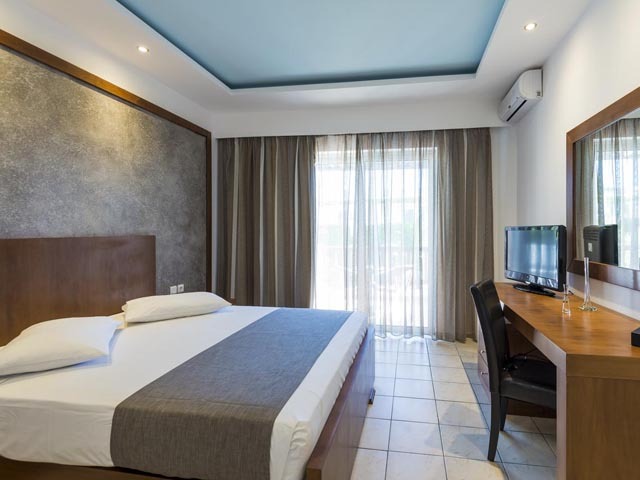 Sunny, comfortable and functional, the hotel consists of a central building that includes the reception area, lounge, restaurant and main bar, as well as a series of other two story structures that serve as guest accommodations and that radiate around this main building.